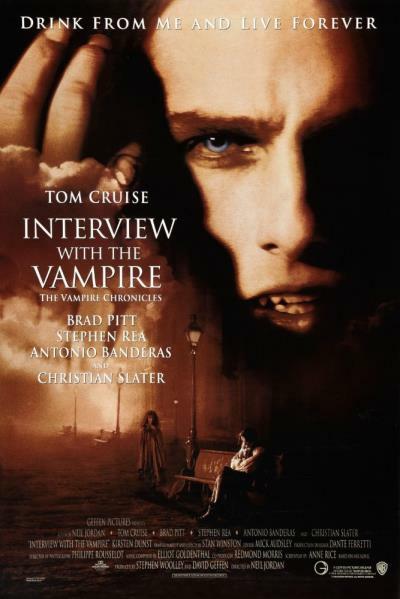 In modern-day San Francisco, reporter Daniel Molloy (Christian Slater) interviews Louis de Pointe du Lac (Brad Pitt), who claims to be a vampire. Louis describes his human life as a wealthy plantation owner in 1791 Louisiana. He had lost the will to live following the death of his wife and infant child; one night he is attacked by the vampire Lestat de Lioncourt (Tom Cruise) while drunkenly wandering the waterfront of New Orleans. Lestat senses Louis' dissatisfaction with life and offers to turn him into a vampire, to which Louis accepts prior to being transformed. But while Lestat revels in the hunt and killing of humans, Louis resists killing them, drinking animal blood to sustain himself. He is disgusted by Lestat's pleasure in killing and comes to suffer tremendously as a vampire. Read more on Wikipedia.